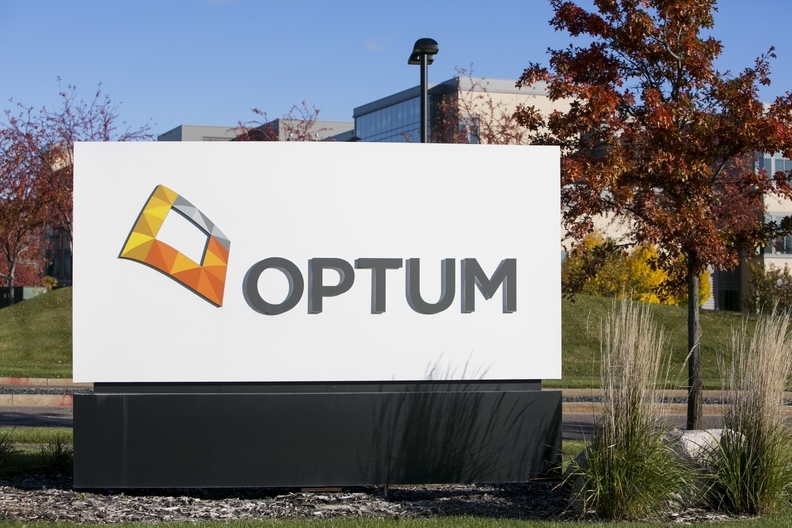 A logo sign outside of the headquarters of Optum in Eden Prairie, Minnesota on October 24, 2015. Shareholders and company executives finalized the Advisory Board Co.'s $2.58 billion deal with UnitedHealth Group and a private equity firm that will split the consulting group's healthcare business from its education arm, the companies announced Friday. UnitedHealth's Optum health-services segment will take over the Advisory Board's healthcare business for an estimated $1.3 billion, including its debt. The Advisory Board provides independent research, advisory services and data analytics for more than 4,400 healthcare organizations. Private equity firm Vista Equity Partners Management will acquire the Advisory Board's education business known as EAB, which includes the high-performing Royall & Co. division, for $1.55 billion. EAB provides research and technology services for more than 1,200 educational institutions and will operate as a stand-alone business. Advisory Board shareholders will net estimated cash per share of $53.81, down from the initial valuation of $54.29, which includes a fixed payment of $52.65 per share and the amount in cash equal to $1.16 based on the per-share, after-tax value of its equity stake in Evolent Health. Optum has relationships across the healthcare spectrum that span more than 300 payers and 115 million consumers, which will expand the combined organization's research breadth, said Advisory Board CEO Robert Musslewhite, who will continue to lead the healthcare research and technology business. "They bring a ton of data and analytics that strengthen everything we can do in our research, and they bring some technologies we do not have on the consulting side that will allow us to develop deeper relationships," he said. "The challenges our members have been wrestling with transcend the acute-care market. This positions us to help tackle the changes happening in the industry and how they interplay with other sectors of the broader system." The Advisory Board has had trouble maintaining steady revenue growth on the healthcare side following the presidential election and subsequent uncertainty in the market, as some providers dialed back their purchases. But that political uncertainty has also been a boon for its education arm, similar to other consulting firms that are increasingly relied on by healthcare organizations to help them navigate issues like caring for a rising number of uninsured if the Affordable Care Act is repealed. The company saw its net income plummet in the third quarter to $685,000 on revenue of $183.1 million, down from $37.5 million in net income on $200.5 million of revenue in the third quarter last year. Given the financial pressures providers are facing as hospital admissions dip, reimbursement dwindles and more difficult cost-cutting strategies like reducing clinical variation loom, there has been more demand for services that deliver return on investment in the short term. Providers seek Advisory Board's solutions surrounding revenue cycle, cost reduction and risk-adjusted reimbursement, while demand has waned in areas like new technology where return is more difficult to capture and decisionmaking is heavily affected by the ever-changing regulatory environment, Advisory Board executives said. The organization slimmed down its workforce by 220 employees and narrowed its services to offset the financial headwinds. It has focused its research on optimizing revenue cycle, health system growth and reducing variation and dropped topics including care management workflow and infection control analytics. Analysts at Canaccord Genuity said that the transaction price is fair given that the Advisory Board's healthcare business underperformed over the last several years while the education arm has done relatively well. Some critics have expressed concern that the merger would skew the Advisory Board's insights to benefit Optum. But Advisory Board and Optum executives were quick to dismiss that notion. "Delivering credible, objective and independent insight is a fundamental part of our model and that won't change," Musslewhite said. "You don't acquire the breadth and depth of a client portfolio (like Optum) unless you are thoughtful and focused on the appropriate security, confidentiality and rigor in service delivery models to ensure you are objective," said Eric Murphy, CEO of OptumInsight, Optum's advisory consulting branch. The company has been exploring "strategic alternatives" including a potential sale since 2016 and officially announced it was shopping the Advisory Board around in February, not long after activist hedge fund Elliott Management Corp. and related entities bought about 8.3% of its shares. "We felt that those business were on different investment and growth strategies," Musslewhite said. "Throughout 2016 and early 2017, we restructured our healthcare business that had slower revenue growth and accelerated our timeline in exploring strategic alternatives. We felt at some point we needed to have each business make independent decisions rather than allocate capital between them." The company spent $7.8 million in the third quarter and $17.2 million over the first nine months of 2017 on merger expenses, according to the company's third-quarter report. Advisory Board shareholders approved the transaction along with the executive compensation packages Wednesday. Since the deal cleared, Musslewhite will receive a $2 million transaction bonus, Advisory Board Chief Legal Officer Evan Farber $1 million, Advisory Board Chief Financial Officer Michael Kirshbaum $750,000 and Advisory Board President David Felsenthal $750,000. Musslewhite and Cormac Miller, the Advisory Board's chief product officer, will receive an annual base salary of $700,000 and $360,000, respectively, an annual short-term incentive equal to 100% and 50% of base salary, respectively, and annual long-term incentives equal to $3.85 million and $785,000, respectively. Should the executives leave the company, their golden parachutes would entail a cash and equity package totaling $12.35 million for Musslewhite, $7.69 million for Felsenthal, $3.51 million for Advisory Board Chief Operating Officer Richard Schwartz, $3.31 million for Kirshbaum and $2.35 million for Miller. Optum has built a business that focuses on operational efficiency and effectiveness—combining relevant insights on the provider side of the market is a natural fit, Optum's Murphy said. "If you take that capability and insight and expand it to health plans and life sciences organizations and bring forth the technology and managed services to capture what those insights mean for them, you start to impact the overall healthcare ecosystem," he said.